Mississauga, Ont., September 17, 2015— Canadian Business and PROFIT today ranked Nexus Systems Group No. 237 on the 27th annual PROFIT 500, the definitive ranking of Canada’s Fastest-Growing Companies. 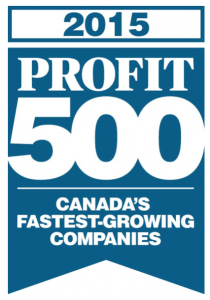 Published in the October issue of Canadian Business and at PROFITguide.com, the PROFIT 500 ranks Canadian businesses by their five-year revenue growth. “Nexus Systems Group is honoured to be on the PROFIT 500 ranking,” says Co-Founder and Managing Director John Salameh. “This achievement reflects the strength of our service delivery and the dedication of our team.” Nexus Systems Group, proven itself to be an emergent market leader and has earned its ranking in this year’s list. The company offers specialized services centered on delivering quality business and technology solutions for its clients—including staff augmentation and contract administration—and ensures that business and resource needs are always met. For the past five years, Nexus has experienced consistent growth and currently serves numerous major clients in the financial, insurance, government, telecommunications and retail industries in North America. With the help of its dedicated expert staff, Nexus shows no signs of slowing down and anticipates that it will only continue to expand in the future. Nexus is a trusted partner in staffing technology organizations throughout North America – with leading edge staffing processes and a trusted team of resourcing specialists, Nexus delivers the results you expect.